25 August 1945. Mountbatten’s chief of staff, General ‘Boy’ Browning, advises his commander to urgently renegotiate the troop integration issue with Aung San and other PBF commanders. Few soldiers of the Patriotic Burmese Forces are currently being selected for the Burmese Army, most being discharged. SACSEA in Kandy is alarmed that PBF/resistance troops might go underground as many soldiers have not surrendered their weapons. 25 August 1945. On his way to meet the commander of former puppet forces in the area, OSS Capt. John Birch is murdered by CCP troops near Suchow. The infuriated U.S. commander, General Wedemeyer, confronts Chu Teh immediately and five days later in Chungking he warns Mao and Chou En-lai of grave consequences, but he avoids a showdown; Birch seems to have provoked the incident. Later, Birch is seen as the first casualty of the Cold War and, in 1958, his fate inspires the formation of an ultraconservative, anti-communist society. 25 August 1945. The Japanese military announces it will cease all operations in Malaya at midnight. Having clashed with MPAJA guerrillas over the previous weeks, Japanese commanders broadcast an appeal to the officers of Force 136, the Allied liaison group working with the guerrillas, to cooperate in keeping the peace. 25 August 1945. A small French commando force led by Colonel Hans Imfeld enters Luang Prabang and takes charge. It is supported by the Lao king, who seeks a return to the situation before April when, under Japanese pressure, he renounced the French protectorate. His vision is a gradual transition to independence. Lao Issara activists, having heard De Gaulle’s calls for the restoration of the French Empire, remain sceptical. 25 August 1945. 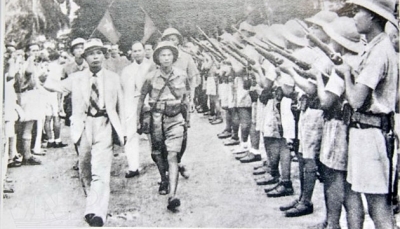 Although only four days earlier they had joined with fellow Cao Dai, Trotskyist and Hoa Hao members of the United Front in a mass demonstration in Saigon, after days of turmoil the Vanguard Youth now forms a new alliance with the now-openly ICP-led Viet Minh. At a giant demonstration in Saigon, this rickety coalition launches an insurrection in the name of the Southern Provisional Administrative Committee. By the end of the day, the city is secured and Imperial Delegate Nguyen Van Sam is under guard. Further seizures of power follow in cities and towns across the south. However, the situation is far from settled; other groups are angered that the ruling committee has only ICP members or supporters.